Warriors team-mate Stephen Curry scored 12 of his 15 points via four three-pointers during Golden State’s 35-point third quarter on Thursday. The Pacers, who missed another chance to clinch a playoff spot, were led by Tyreke Evans’ 20 points off the bench. Donovan Mitchell scored a game-high 34 points but the Utah Jazz still lost 117-114 to the Atlanta Hawks. In the final moments, Mitchell missed a 22-foot three-point shot that would have tied the contest with 1.8 seconds remaining as the Hawks snapped the Jazz’s five-game winning streak. Trae Young led Atlanta’s efforts with 23 points and 11 assists in a double-double display. Email “Durant leads Warriors to victory after friend's death ”. 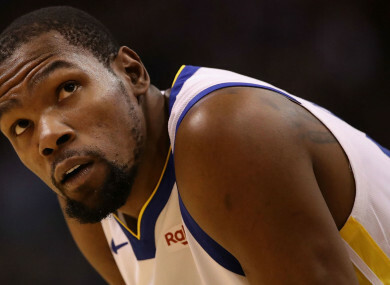 Feedback on “Durant leads Warriors to victory after friend's death ”.